A break in the weather , and after ambling around the polytunnel hand-picking slugs, and making up a batch of dough for beer bread (not with the slugs! ), I found myself throwing the little kayak on the back of the truck and running over to the reservoir. It's only eight miles to the put-in, so I feel I should get to do this from time to time. The lake has six miles of shoreline and so there is an endless variety of things to see and do. The gallery of gulls, cormorants, grebes and such changes subtly throughout the seasons. I found some immature black-legged kittiwakes in among the numerous Western gulls; these were new to me and I had to spend some time with the bird book when I got back to the house. They are so small, at first I thought they might be sandpipers. Blown off course? I know it's mischievous of me, but I cannot resist drifting along the boom of the boat basin, launching one nervous gull at a time from the top of the boom as I come too close. They wheel around, complaining, then circle in to land about thirty feet behind me, which seems to be their personal distance. The grebes and cormorants require more space than this. There are no coots yet, which means it is officially still autumn -- they are our winter waterbird, and come to the lake in thousands. There was only one powerboat out, where ten years ago there would have been dozens. A deep-seated vee-hull, it went by at a brisk pace, setting up a large wake in the glassy water, and as the swells came near, I turned into them and rode them over, counting. There are usually twelve substantial waves, with the eighth one the biggest, and most likely to try and climb into the cockpit with me. I wondered whether that's some universal thing, like the preference water is said to have for spinning one way from bathtubs in the northern hemisphere and the other in the southern. Or is it more to do with depth or the size of the body of water in some way? Wind waves, on the other hand, after crossing a couple of miles of water, seem to travel in sevens. There are two reservoirs right here; the other one, behind the hulking dam to my east, is too grand and wild for me at ten miles long between canyon walls -- a vicious wind tunnel with few safe exit points and over two hundred dark and cold feet deep. This one averages eight feet, no comfort if I rolled over, but it's just tamer all around. It's certainly big, and a serious chop can set up just as you get out to the middle. It can be tiring to get back to the dock from the other side when the wind turns. But within my strength and small skill set, if I know when to Stay The Heck Away. This time, though, everything was still, with the sun vanishing into the mist of another front seeping in from the ocean, and its pale light glinting strangely off the miles of glassy water. I could see into the depths more than usually, and unexpectedly found the greenery robust and still growing, resembling vast coral formations. It looked like August down there. As we have still not had a serious frost, I found thousands of summery insects dapping on the water, and drowned or drowning bees and yellowjackets everywhere. some caromed off the hood of my jacket or landed and crawled about on my life vest. A quarter of a mile from shore, there was a mislaid orb-weaver spider, resolutely marching farther out to "sea" like a water strider. She paused when the shadow of my dripping paddle passed over her, then carried on. This no-frost thingy is disturbing to watch. The grass is growing like it's March, and we have been putting clippings on all the garden beds and around trees. There is a new generation of garter snakes -- we don't remember seeing that before. And the lettuce and assorted brassicas planted according to directions for winter gardening are bolting. Signs of the times, perhaps. In our alternate universe lives as farmers, my husband and I have been wrapping up summer's bounty. I processed the last of the tomatoes, which exactly covered one dish of chicken Parmesan, yummy. We picked a lot of jalapenos this summer. I smoked the red ones to make chipotles, and I dried the green ones as backup chiles. I think we are covered in that department. In the winter garden we have 6 Brussels sprouts, which are being eaten by parties unknown, 18 cabbages which are faring better than the sprouts, and an assortment of lettuces and chard. The latter have not yet expanded in size to the point where we can snitch some leaves. I also planted garlic and some onion starts. Next up: walnuts. We have a bumper crop of both English and black walnuts that are now dropping into the grass by the bucketful. There is a crop we could sell, if we had the energy to do all the drying, cracking and picking of nutmeats. My husband's elderly "cousins" (related somehow but hard to explain), husband and wife, who lived across the road from our farm, lived very frugally and amassed great wealth. They "retired" in their 70's, allowing their adult children to take over the hard work. But they started another business by picking up walnuts from their trees and processing them by hand. They had buyers as far north as Albany who bought their nutmeats. If they hadn't both died they'd still be cracking nuts. Guess it's our turn. At the very least we can satisfy our own needs from our trees. Another ongoing fall task is pruning the fruit trees. I did a lot last year, but much more remains to be done. I expect it will take several years to rehabilitate these trees. We harvested 5 pears, a few prunes and a quarter-bucket of apples this year. It can only get better. My friend M., a mycologist, has suggested I do a mushroom survey at our farm this weekend and bring whatever I find to Mt. Pisgah. There will be a mushroom festival going on, as I'm sure you are aware. I am excited--there must be some 'shrooms on the farm, surely! I've stepped on a few but I haven't actually gone looking for them. I will try to get H. to help me out. She is fond of mushroom hunting. It would be nice to have a wild crop to look forward to in the fall, and perhaps the spring too. Break's over, got to hop back on the treadmill. As we are having another rain day we continue with the "cold room." Some scraps, 2X4s, some 3/8 plywood, a door. Mostly in the big cans is wheat berries, pearl barley, cracked wheat, spelt flour, WW flour, rye flour, amaranth, quinoa, rolled oats, rolled wheat, buckwheat flour, dried red beans, dried white beans, dried black beans, chickpeas, WW angel hair. Sacks and some boxes; potatoes. Boxes; apples. Jars; dried tomatoes, dried apple slices, dried zukes, dried/or for seed runnerbeans and fava beans, some boughten stuff such as pickles (we buy these to get the gallon jars). Bowls or bins of eggplant, turnips, beets, onions. Not shown: winter squash, pumpkins (still curing in the living room); ropes of garlic, 16 liters of homebrew, 24 bottles of (we hope) grape wine/cider. R14 insulation leftover from a project a decade ago finds a home here. A primer coat on the new cold room wall. Woooo, tired! Head upstairs for Chicken Tomato Vegetable. It's been simmering in the crockpot all afternoon. The weather was gorgeous (that was yesterday), so Last Son came over to consult with us on his thoughts for the other side of the creek. Long time readers will remember that I had planted that hillside with willow whips in hopes of coppicing them for firewood in a few years. I had success with this idea in the past, but this time the willows were caught in a drought, and I was overwhelmed everywhere and did not bring them water often enough. So I told the young fella the area, a little less than half an acre, was available for whatever he might have in mind. "My, that's ... it's a lot of work. The trellising alone is like you're setting up an antenna to phone Jupiter or someplace." "I'm not doing much else." So we walked it over yesterday, and I explained the problems. "The slope is northeast, not south, and that part flooded all the way up to here in '97, and this upper bit is too dry every year as it was a log deck once, and is super compacted, which is why it only grows Queene-Anne's lace, yarrow, and sourweed. Plus it's right by Mrs. T's house, and commercial hops wants to be twenty-five feet tall. It's a hair too steep to till, too." "How would you handle it?" "Well ... well, I would cut the ashes and maples to get in more light, deer-fence all the way round, cover the entire place with cardboard and straw, plant it to fava beans, scythe that crop the following year, mark it off, get dwarf rhizomes, plant them, trellis to only twelve feet, using the tripod method, put a pump in the second well and run soaker hoses, then market the rhizomes to homesteaders instead of building an oast house and trying to process all the flowers." "Uh huh, so when do we start?" So, he and I spent the day firewooding and pulling stumps with the pickup and a wire rope, block and tackle. It's really nice to be doing this together; maybe he will be around more now that he's investing some sweat equity. Today, though, I was home alone, and the clouds sat down on the hills and proceeded to try and make up for not raining much since, oh, last year. We would need an indoor project. The story so far: Take one sunless corner of a room that was once a garage and has been a bedroom sometimes, storage room otherwise, with a plywood floor laid over 1X lumber on a cement floor. Take up the plywood in the chosen corner. Treat and polyurethane the bit of wall where the old hot water heater on the other side leaked, years ago. Take one 102" Craigslist freebie cabinet and cut it down to fit in a 91" space. Paint it white. Drag it in through the entry way, where it does not fit around any corners, stand it on end (very high ceiling), rotate it, drop it slowly into the washroom, back it into the spare room, rest, stand it on end again, rotate it again, drop it slowly into the corner, walk it back to the wall. Bring the potatoes, apples, turnips, beets, onions, dried vegs, grains, and beans and park them in the corner. Now punch two holes through the exterior wall (it helps at this point to own your own place, which you plan never to sell). Here we are trying this at 1.5 inch diameter -- one hole near the foundation, one near the ceiling. This is for airflow to keep the temperature down. Insert pipes to fit snugly. Cover the ends with screening (you will need to inspect your screens periodically). Isn't this fun? Who would watch television when they can be poking holes in their house instead? So, next, since Craigslist hasn't been generous with lumber, insulation and solid-core doors lately, is a bit of shopping to build the fourth wall. And a way to get in. Beloved got home from work, and we had dinner together: tomato-vegetable soup with polytunnel greens for me, ratatouille on rice for her. Afterwards we went on a tour of the day's work. "Oh, I like it! Will there be more cabinets?" "When we find some. They should hang on the wall so the big grain cans will sit underneath." "And hooks. We could have hooks, and if anyone gives us a smoked shoulder of mutton, we could hang it here in the cold room." Yes, that is supposed to be beer over there. But the yeast, though it's not past its date, doesn't look like it's doing right, so I might have to go get a new batch. Also made 14 pints of tomato puree, froze a buncha shelled beans, blew out some goose eggs, straightened a lawnmower blade, threw grass clippings on the garden beds, divided some chives and cilantro, cleaned house ... uh huh, and what are you gonna do when you retire? I also wrote a letter. Over the last few days, in fact, have written several. As in I leave a trail of snailmailer-slime all the way out to the mailbox, pop in the envelope with little flowers drawn all over it, snap shut the door, and lift the little red flag. And then stand for a moment at the end of the driveway, waiting for a yellow leaf to cut itself from the tall ash tree, begin circling its wide column of cool air, and drift -- down -- down -- down, to bump me on my smile. Uh huh, that's what you're gonna do when you retire. A hill of beans. The seeds with their germ eaten out are peas. All of these will be frozen and eaten over the winter. In my spare time, over the last few days, I have sorted beans and potatoes and tomatoes mostly, and, weather permitting, raked the mulch from the garden paths onto the beds and am covering them with cardboard and straw; Beloved has made applesauce bread, borscht and ratatouille and maintained her flocks. There are more tomatoes, shaken from vines I've pulled up, lying about than I will ever pick up. I'm afraid they will make quite a lot of volunteers. I'm still finding green pumpkins as I put the beds to bed, and I cut them up with a machete and hand them over to the flocks, who seem to greatly appreciate them. Today it rained a fair bit, but yesterday was hot. I worked in shorts and sandals, sunglasses, and straw hat. In fact, a fair amount of housework got done, because I kept coming in to hide from the sun and the dishes and floors called to me. I put some Greek Orthodox choruses on the CD player and did sink time and broom time, and finally got up the courage to take away one chair from the crowded living room and rearrange the furnishings. I thought it looked pretty good, but the test would be Beloved's arrival. She came in from work, put down her things, checked phone messages, went across the living room to go see the chickens, and froze. She walked over to one of the remaining chairs, sat in it , and looked about her. "This works. It works. I haven't liked this room for years, and now I do!" "'Course, it's a bit too crowded in the musical instruments corner ... "
The beans looked like being a disaster, as they grew up and made pods, a first, second, and third crop, but more than half the pods never browned as I used to seeing them do. I should, I suppose, have just picked a day and cut them all off at the ground. So a week ago I gathered just about as many pods as I could, brown, yellow, green, or spotted, and have been shelling all alike. The varieties of green beans had all proved rather long-season, and several were not to our taste for a variety of reasons -- so we think we will start over with our favorite, var. Helda. So we're only keeping runner beans for seed. Each pod, as I came to it, was judged on its own merits, and the purple-with-brown-specks mature, dried beans mostly went to safekeeping, and the pink, wrinkled, misshapen or only-one-was-in-the-pod ones added to the freezing or drying piles. Six quarts made the seed bean grade. If all had matured as they did last year, there would be fifteen quarts. It's a good thing we're not doing this as a money business! Our family responded to the oil embargo in the 70s by moving to the country and homesteading. We were interested in raising our own food, providing our own power, building our own house, exploring simplicity, and finding ways to lighten our impact. Sometimes we've backslid from the goals that we had then, but we always thought there was too much junk in the atmosphere, and that there would be a reckoning someday for digging up so much poisonous stuff and burning it, spewing it into the atmosphere and soil and sea in order to achieve speed and convenience without consideration for others and other living things. We're back to basics -- trying to learn how to manage on one acre -- even with more than 35 years experience in gardening and homesteading we feel there's not much we know that we need to know. We grew enough food and to spare this year to live for a year and plant from our own seed for the following year, as well. That was the first time we could really say that -- but it was a lot of work. It was a lot of work. And we're not, ahem, getting younger. We basically pretty much quit going to concerts or plays or movies or watching TV, and didn't go away on vacation. Our entertainment consisted of bringing each other solar tea for sit-down breaks in the garden. We sipped, absorbed sunshine, and remarked on the hummingbirds who'd built a nest in the plum tree. So we didn't feel deprived. So I've siphoned something into twenty-four wine bottles and corked and stored them, labeled '09. With any luck it will be wine; we'll know in a year or so. Halfway through this activity I went to get more bottles and discovered that a windstorm had arrived. I hadn't really finished securing the polytunnel and the poly wrap was doing its best to draw my attention to the fact. As in flapping about and dumping bricks off its skirts. The whole shebeen was preparing to do its Kitty Hawk debut. I dropped winemaking for the next couple of hours and ran back and forth in the --quite alarming by now -- wind and rain, gathering basalt cobbles from the dry wash, lugging them around the corner of the house in a Little Red Wagon, and throwing them at the base of the polytunnel all around. As soon as I'd distrubuted my four hundredth pound of rocks, the wind died down. Ah, well. Job well done, stand back and admire, neh? Here's the thing: I'm not strong enough to do rocks any more. Age: sixty; back: bad, cardio: so-so. I gave up lifting plastic buckets of rocks about six years ago, and have been trying to recruit others to this engaging and interesting task ever since. And yet, this morning, with our winter's veggies and a hundred bucks' worth of polyethylene at stake, I found myself leaping into the creekbed, chucking rocks into the bucket, hauling the bucket over to the footbridge and heaving it shoulder-high onto the bridge with a resounding thump. Sometimes you can do what you can't. Rain is coming in three days and I dislike processing mud, so I have been crawling around in the polyculture beds with a three-tined hand rake, discovering potatoes and garlic, beets and turnips, and also picking any green bean or runner bean pods that have turned brown, or yellow, or even have the red speckles on them that mean they are thinking of turning yellow or brown. The chickens appreciate all this, which they are sure is being done entirely for their benefit. They follow right behind my moccasins, scratching, pecking, chattering among themselves, getting had, and doing all the things chickens do. One of them tires of following and struts past me to hop up on the wheelbarrow, which is groaning with potatoes, and carries out an inspection -- but potatoes aren't really her thing. So she turns round and watches me inching past, feeling around in the old much for new spuds. I spook a mealy bug and she's on it, for all the world like a red-shouldered hawk on a white-footed mouse. The geese regard themselves as above all this and have rucked out a goose gazebo under the grape vines. Legs folded beneath them, they sit in a patch of pale autumnal sunlight slanting in under the arbor, and with all the epicurean delight of a slow food aficionado, nibble at overripe grapes. Last April, at the end of one of these multipurpose beds, I planted a section with bok choi, kale, and turnips instead of the potatoes or tomatoes, and came back through with beans as I did elsewhere. The beans didn't flourish as much here, and the greens got more sunlight than those I spotted into the potato patches. They needed, and got, more water than the others, and put on more weight accordingly -- that is, the turnips did. If we were fonder of turnips than we are, we'd think this a Really Good Thing, but to us it was more of just a Good Thing. I like turnip greens, though I like spinach better, and I'm okay with mashed turnips, though I like potatoes better -- so it goes. Once I've had either the greens or the root for two or three meals, I seem to be done for the year ... meaning there was a whole lot more turnip than appetite, a situation known as Grossly Overplanting. So we've mostly done two things with them: drying and stock feeding. Drying has worked out really well. Whenever the solar dehydrator wasn't full of sliced tomatoes, zukes, pears, or apples, it had herbs and greens in it -- mostly turnip greens. They're done in two days -- in some of the weather we had this sumer, in less than one day. You take out the now-feather-light leaves, hold the end of a few stems in one hand, point the leaves at a cardboard box, strip away down the stems with the other hand, and the box starts filling with dried green flakes that are nutritious and tasty in soups, in breads, and on whatever. Today, for example, on homemade spaghetti sauce. The birds will eat the greens when there's not much else on offer, meaning that right now, when they have the run of the whole garden, they are steering clear of the turnips. If we had cows or pigs, the roots could be considered stock feed. But not for the likes of ducks and chickens. Well, maybe if we cooked them up. But we have enough squash and pumpkins to last them all winter, I think. So, against my better judgment, I go over to the turnip bed and tug experimentally at a leaf. A champion among turnips rises from the earth and imprints on me. One of the things preparedness thinking does for you, besides get you a rep as a doomer, is help you get through short-term emergencies better. We've always had kerosene lamps and candles and food ahead and so on. But we were thinking, okay, it's been more than a decade since we had the flu, and sometimes when we have, we were really out of it. As in the kids (this was back in the 80s) fed themselves (and the cat, and all the ducks) for three days while the suddenly useless adults lay in the depths of the mattress on the fold-out couch in the living room with no idea who we were, let alone that we had responsibilities. They all remember this as a major watershed event in their lives. We got away with it, but it scared them -- and us, in retrospect, and we've "done things ahead" ever since, and emphasized training. The oldest child in the house knew all about calling family friends and 911 and so on, within days of our recovery. I'm at home a lot now (and very busy in the front "forty"), but Beloved is a high-public-contact worker, as in rubber gloves level, so we figure our number is coming up. So the current justification of the Preparedness Game is oink-flu. Today I'm cleaning cereal boxes and assorted "paper" trash out of the kindling box, and loading it properly, with what to our eye looks like four weeks' worth of kindling. Similar things are happening all around the house, inside and out, and restocking of staples and the medicine cabinet goes on apace. For a proper to-do list of this sort of thing, I recommend you go here. 'Kay, that's done. Off to look for some rose hips. I knew, from the rate at which el nino was growing, we would have a very late frost. The first one, such as it was, arrived a few days ago -- touching only the roof of the house and the cucumber vines. The tomatoes and zukes slept through it all and missed it. That's all well and good, but we have to get crackin' on next year's prep. 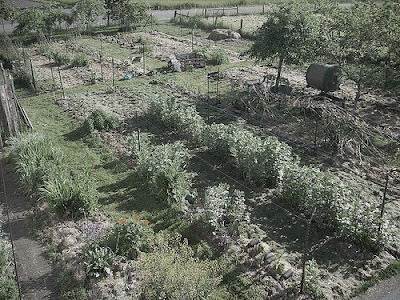 This is a no-till garden, which one might think means no-work, but it's, in its own way, as much work or more than clearing off, burning residues, and tilling. The point of burning residues, which is much practiced around here, is to kill the eggs of plant predators and the various diseases that can build up. 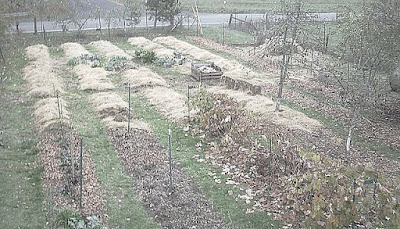 We've adopted the alternative of having the poultry go through for the bugs and then cutting everything up small and burying it in leaves and straw -- so that beneficial organisms can get ahead of the inclement ones. We even use cut-up twigs in the mix, on the theory that more variety in the organic matter means more variety on the garden's plate. Things left to rot down must have time to rot -- so we're interrupting the summer garden's eleventh inning rally in order to start the process for next spring. Everything needs to be as near the soil as possible. I'm hoping to get a broadfork, maybe this year, and open the soil underneath a bit, which does much of the work done by tilling, but without disturbing soil structure nearly as much. Anecdotally we can say that while our produce -- open pollinated, grown on perpetual mulch/compost, and widely interplanted -- does not outperform row gardening in poundage, it seems to us remarkably bug- and disease-free. We do have a squirrel problem this year, plus we had to erect that gigantic deer fence -- the sort of thing that can happen to anybody who sets out a feast in the yard -- but, apart from aphids here and there, things have been quiet. Fewer hornworms, fewer cabbage loopers, fewer cucumber beetles, almost no blossom end rot, no cutworms that I could see, and the slugs and snails have backed way off -- no doubt that part has to do with running the poultry around the perimeter, as a kind of moat filled with inquisitive beaks and bills. This week we are taking down fence posts and wires and supports, cutting up stems as we go, and finding gleanings for ourselves and the chickens, ducks, and geese. The chickens are turning up heaps of potatoes that I'd missed, and their assaults on the beet greens and cabbages turned out to be mostly about aphid eggs. There are surprises. I had thought everyone would be all about grapes, which are a favorite when tossed over the fence. Instead, they have all ignored them. Protein is the order of the day -- chickens are exposing ant nests and picking up the eggs, ducks are inveigling their bills into the depths of the beds for buried slugs and slug eggs. I think of slugs as something that comes with rain, but I suppose they must hide somewhere, even in a drought. The paths are too tough for the ducks' built-in shovels, but the beds are loose enough to be sifted, so that is where the action is. The Annies (Ancona ducks) don't get to be part of all this, because they have separate pasture. Their guy, Andrew, is permanent persona non grata to Sylvester, the gander, and also we want the Annies to breed. So I have to continue bringing them things. Unlike the Deloreses (Khaki Campbells), they take no interest in corn -- this may be because Sylvester and Susannah break up the kernels for them -- but bean vines are very welcome. Also, they are very pleased with cooked-up immature winter squash, which we have in plenty this year. Becuase there is a nip in the air in the early mornings and late evenings, we have been building small fires in the woodstove -- just hot enough to do the squash. So it's an evening chore to these up and put them on in a saucepan of water, and in the morning I drain the water (for use in soups and bread) and dump the squash over the fence. The Annies are very shy and hide under the willow coppice while I'm doing this. But I know it's appreciated; when next I pass by, the ground there is squeaky clean -- not a scrap remains. The week in review: frost touched the cuke vines but not the tomatoes or zukes. Transplanted red chard, kale, and bok choi into the polytunnel. Harvested tomatillos, mustard, lettuce, arugula, beans, potatoes, winter squash, pumpkins, grapes, sweet corn, tomatoes, eggplant, kale, yellow zucchini, green zucchini, chard, chicken eggs, duck eggs. Canned tomato puree, cooked up and froze beans. Blanching won't do, as they are a bit mature and when we need them, we'll want them faster than the blanched. We can alternate with blanched-and-frozen when we have the time. If I can find those in the freezer! Scored some windows and a large plywood cabinet on Craigslist's free box. Tearing down bean poles and corn stalks. Converting garden waste and grape-wine must into in-bed compost and chicken, duck, and goose smiles. Reorganized canning jars. It appears I've used about a third of them this year. I'd run out of wide lids and was searching for small-mouth quarts -- they were in the back of the cabinet, of course. About half are Mason, half Kerr -- and two are three are an off size labeled Atlas. I like those the best. Very homey looking. Sold chicken eggs and gave away the last of the giveaway summer veggies. 100 foot diet: from frozen: chicken broth and blackberries and plum sauce. From home canned: tomato soup, plum sauce and blackberry jam. From the land: apples, duck and chicken eggs, turnip greens, zucchini, elephant garlic, onions, basil, chives, cucumbers, eggplant, tomatillos, tomatoes, corn. 100 mile diet: Tillamook cheddar, local wines. 1000+ mile diet: Whole wheat noodles -- who knows where they are from -- it's clear they have neared the end of their shelf life and so it's spaghetti all week. I make the sauce -- but I feel I have to add tomato paste from cans (never enough Romas ripening) and haven't found a convenient local source. Oh, and party goodies. More than fifty people came to my retirement send-off! "We should look that up in the Delicatapedia," she said, smiling. The tunnel is up! It's not done yet, but we have already moved in ... much of what we seeded here in August was eaten by pests (squirrels got all the peas, slugs the rest) so we are transplanting things from other parts of the garden to winter over -- which is why the bok choi and kale at right seems a little wilted. Lettuce on the left is going great guns, though. It seems to me the making of one of these is simplicity itself. Build two 3' beds and a 3' pathway between them, and when you're ready, get some ten-foot PVC pipes, snap them together in twos, mark off even distances along the length that you wish to go, punch holes in the ground with a hammer and steel pipe (we used a fence ram and steel fence post), stick the pipes in, bend them across the beds and stick them in the other side ditto, then harness everything together with 17 gauge wire. Cover with a single sheet of plastic (you can push it around overhead with a broom), hold down all the edges with bricks, tighten, and throw some dirt over the bricks. Height is seven feet, so unless you are a really tall Chinese basketball player, you won't have to stoop to work in here. The ends are the hardest part. We've done ours with fence posts, 1X4 sill and lintel, and a piece of 3/8 plywood for the door, at each end. The plastic is cut down the middle, rolled up on laths, and the laths are wired to the fence posts. All the veggies that will winter in here are also planted in exposed beds, for comparison. Last year, and the year before, we had enough of a freeze to make this worth while. The previous ten years we would not have needed it. Considering all the hooraw among greenies right now about plastic bags, and rightly so, I feel a bit vulnerable to criticism for making such a big plastic bag. Arguments in favor of glass are convincing, but at current prices we did what we could do. It's intended to supply us with fresh greens through the winter, and maybe cantaloupes and sweet potatoes next summer. This is not the elegant way to do this, but it's a greenhouse for under $200. We'll see how it goes. Having gone, first, to Florida to check on my folks, and then to my retirement party, and then to a friend's birthday party, I'm woefully behind at home. The pumpkins and winter squash are in, but there are still, it would seem, tons of potatoes, eggplant, corn, tomatoes, zucchinis, and even bell peppers out there -- as we have not yet had a frost. I'm beginning to think of the beans as a kind of crop failure. For as long as I can remember, green beans of all kinds and runner beans as well have dried on the vine by this time and could be harvested for shell-beans and seed; but this year everything made a second crop and then a third -- there are still bean blossoms out there -- and the first crop is still green-podded. I tried shelling a batch anyway, and the beans are immature and viscous. So I'm not at all convinced I'll be able to make a seed crop from this. I'd cook up all the small and medium beans and freeze them, but space is limited -- and we're not fond of canned. Much of this crop may end up as compost. While making up my mind what to do about the beans, I have been winterizing -- going around the house and putting up 4-mil polyethylene in the windows both inside and out. Our windows are the very old-fashioned single-glazed sash windows, and there is a lot of rot in the frames. We have always hoped to replace them with something modern and energy efficient, but time and money were at issue. Now I have time, but not money yet, and, frankly, my carpentry skills are -- fading, along with my eyesight and strength. Thirty years ago I was good with windows, and that was then and this is now, so I do the polyethylene once again. The effect is immediate and notable. A small fire warms the whole house, and it stays warm for awhile, as soup bubbles in the pot and the kettle hisses. Just in time. Beloved has been changing duck water in the rain. She doesn't see the huge rainbow arcing across the sky from river to ridge, she's working so hard. Hot chocolate shall be her reward.